Undoubtedly one of the most popular full size 4WD vehicles in the market today is GM?? ?s 1988-1998 trucks. GM was the first to introduce the SLA (Short Long A Arm) 4WD suspension system design in 1988 and has hit a home run with this model for over ten years. Fabtech offers a 6" system for these popular trucks with the same design features and benefits as our late model 4WD Silverado system. - Increases track width 2" on each side. 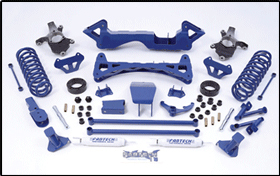 - 4 door Tahoe models require factory truck torsion bar crossmember, isolator, hardware & end brackets. - Some models may require driveshaft modification. - 4-Door models require OE GM torsion bar crossmember, mounting brackets, isolators and hardware for a P/U or 2-door model.